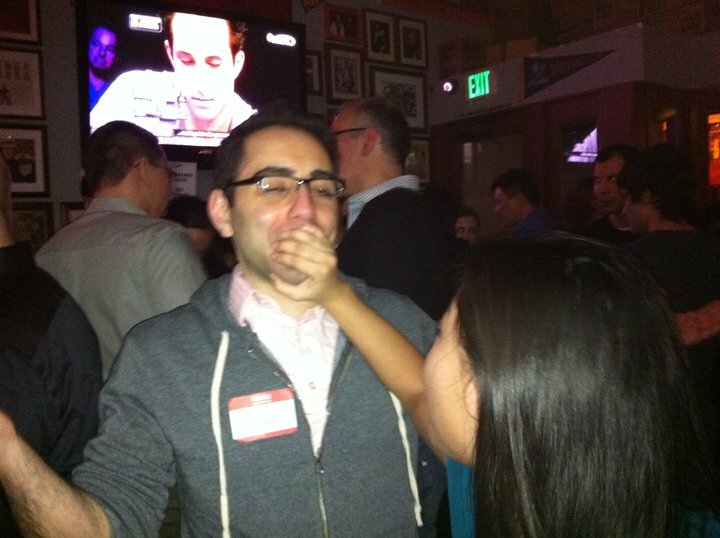 PALO ALTO, CA — Last Saturday evening, the January Quora Active User Party took place at The Old Pro, a local sports bar. Over 100 active contributors showed up to mindmeld over beers and televised sports. Anticipation had been incubating for weeks in this rather socially well-adjusted crowd. Many were looking forward to rubbing shoulders with Quora celebrities like Charlie “Awk Hottie” Cheever, Rebekah “Daniel Day-Lewis” Cox, and Yishan “STFU Scoble” Wong. As they arrived, party attendees were checked against a strict guest list, and the party entrance was manned by none other than Mark “He’s not black?” Bodnick and a bouncer who looked quite like Biggie Smalls. There had been rumors floating around that some East Coast Quorans were flirting with the idea of jetting over, but no one suspected that a stampeding horde of NYC folks would crash the party. Heading up the Yankee Delegation was the de-facto Quorean Princess. Sporting a seductive emerald wrap dress and a hairstyle inspired by The Ring, the Quorean Princess proved last week’s kissing booth rumor wrong by actively dishing out the hate, punching and kicking partygoers, for free, no less. The causes of these spontaneous outbursts of violence were mostly unknown. One such victim, a Craig Mortuary, may have incurred Choi’s rage by wearing his best V-neck sweater vest. It appears that Choi’s plus-one of the evening, a furry pink stuffed bunny hat named Tiger, mistook Mr. Mortuary for a life-sized SpongeBob and incepted the idea that Mr. Mortimer must be punished. Another rumor circulating amongst the in-crowd leading up to the event was that an anonymous user planned to send an Anybot to the party. Quite possibly due to the high crime rate in the mean streets of downtown Palo Alto, no such telepresence made it to the Old Pro. However, Ari-BOT2K, resident Quora admin-bot, did manage to attend. Reaching beyond his usual SuperAdmin setting, Ari-BOT2K held court at the party, explaining the motivation behind his unpopular decisions on Quora, which are often viewed as somewhat draconian, with much sincerity. From our interview, it’s clear that instead of relating to and sympathizing with labels such as “Quora Nazi” or “Content Cop”, Ari-BOT2K views himself more as the Batman to Quora’s increasingly Gotham-like social environment. It is this reporter’s opinion that such vigilante hero actions should be encouraged as long as Quora continues to draw the attention of The Penguins of the Tech 2.0 bubble. Speaking of Marvelous Mystery Villains, the party marked Palo Alto’s first sighting of Brandon Smietana and Ryan Lackey, two highly eccentric and polarizing characters among the active user base. To the general disappointment of many partygoers, the former did not roll up with Danish models, and the latter did not show up as Rambo. Interestingly enough, Smietana spent a significant portion of the evening speaking with Dan Kaplan, who had only two days prior questioned Robert Scoble’s ability to function as a human being. Ryan, on the other hand, was seen in a freshly out-of-the-box shirt from a nearby Macy’s chatting up Shannon Larson, one of the newly minted Admins of Quora. With Lackey back in town, Quora administration may now gain some access to his stockpile of weaponry. Unfortunately, our sources were unable to secure audio evidence for this theory. Indeed, in the New Gotham of Quora, the elites work parties in mysterious ways. Not as mysterious, of course, was why the spotlight remained throughout the night on the Man of the Hour, Charlie “Awk Hottie” Cheever. The dashing 29-year-old Pittsburgh native was seen wearing a red T-shirt with a Quora sticker across where a shorter, less dashing man’s chest would be. There was a constant halo of attractive ladies around him throughout the evening. At one point, an eyewitness reports, a certain someone picked off a piece of lint from his makeshift Quora shirt. We believe this suffices as evidence that Charlie and the unidentified lint-picker must enjoyed a much more intimate liaison. The party maintained a healthy social simmer all night, and if it weren’t for the astute eye of this this reporter, we may have missed a highly intriguing yet extremely brief meeting between Yishan Wong and Dan Kaplan, two men who have led the 3rd party debate regarding Quora’s progress in scaling to a mainstream audience. Dan Kaplan penned the “Scoble and Scale” article, publicly expressing Scoble’s inability to function as a human being, merely two days prior to the event. Kaplan was seen shaking hands and exchanging a gang signal with Yishan Wong, General Editor of this blog. It has been an exciting week for both Mr. Kaplan and Mr. Wong. As a result of their collaboration, Robert Scoble, feeling the heat from Mr. Kaplan’s first article, declined to attend the party (under the excuse of attending a camping retreat called “Davis”), and instead penned an angry post the morning after the party denouncing people who had downvoted him or found his answers unhelpful. In a quickfire response, it is reported that Kaplan sought permission from Wong to volley back, and, finding Wong absent from his computer, wrote a rebuttal to Scoble’s rebuttal. The rest, as they say, is Silicon Valley Bitchfest history. The party was planned to run from 7 to 10pm. However, when this reporter headed back to the city at 10 past midnight, the party was still in full swing. If you have more tales from the Quora Gone Pub event, please email me at amuffington@gmail.com. Anastasia Muffington is a fictitious rumormonger on Quora Review’s imaginary payroll. Her reports don’t matter, and in no way represents the views of Lynn Tao, an occasional Quora contributor. You are currently reading Mobile Kicking Booth, AriBot2K, and Weapons of Mass Distraction at the 2011 Quora Gone Pub at The Quora Review.